The e-book for ABLE Bodies Balance Training is available at a reduced price and allows readers to highlight and take notes throughout the text. When purchased through the Human Kinetics site, access to the e-book is immediately granted when the order is received. ABLE Bodies Balance Training offers an activity-based program to improve balance and mobility for both fit and frail older adults. This practical instructor's guide provides more than 130 balance and mobility exercises that consider flexibility, strength, and cardiorespiratory endurance. The exercises enhance older adults' abilities to maintain balance in completing their everyday tasks, thereby fostering increased self-confidence, reducing the occurrence of falls, and improving quality of life. The text is based on ABLE Bodies techniques, which were proven effective in a randomized, controlled study funded by the National Blueprint and Active Aging Partnership. Results showed that ABLE Bodies training significantly improved balance, mobility, activity levels, gait speed, flexibility, and strength for participants 70 years of age and older living in retirement and assisted living facilities. Beginning instructors can follow the 16-week session plan as a well-balanced training program that safely progress older adults through the exercises. The material is complete and may extend to a yearlong program. More experienced instructors may select exercises and activities from each of the five component categories to meet the individual needs of their older adult clients. The component-based organization of the text allows instructors to easily incorporate both exercises and conceptual ideas in fun, engaging, and creative ways into their existing programs. 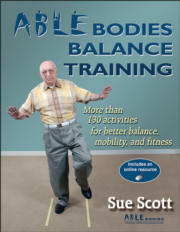 As a bonus, access to a dedicated ABLE Bodies Balance Training Web site is included with the book. It offers 15 downloadable activity handouts that instructors can print out and distribute to patients or clients for use at home. It also offers downloadable handouts of all the balance training activities in the book—over 130 conceptual ideas and activities to choose from either for planning their own sessions or for aiding their delivery of the 16-week session plan. The text also offers a variety of tools, including step-by-step instructions, sample phrasing to use when encouraging participants, ideas on making activities progressively more difficult, and tips on promoting safety while performing the exercises. The proven exercises and conceptual activities found in ABLE Bodies Balance Training offer both fit and frail seniors increased independence in daily living. By incorporating the ABLE Bodies Balance Training program into their work, fitness and health care professionals will educate and motivate older adults to increase stability and improve self-confidence and health. There’s more to balance training than just balance! This chapter outlines the five components that make up an ABLE bodies training program: flexibility, posture and core stability, strength for a purpose, balance and mobility, and cardiorespiratory endurance. You know the components, but how do you combine them to create a solid training program? This chapter explains how to set up classes, how to select and progress activities, and how to be a more effective instructor. No matter how well you set up your training sessions, they aren’t any good without the proper safety guidelines in place. This chapter outlines how to create plans and establish rules, ensure the mental and physical well-being of your participants, and prepare for emergencies. Flexibility offers a greater range of motion, and that is key in older adults. In this chapter, you’ll find flexibility activities that can be done while seated or standing, as well as conceptual activities. A strong core is key to good posture and overall balance. This chapter offers activities specific to both posture and core stability, as well as activities that progressively increase strength in these two areas. Overall strength is a goal, but there are also specific areas that need more attention in older populations. In this chapter, you’ll find lots of strength activities for the legs, back, chest, and triceps. If you want activities that focus on balance, then this chapter is for you! Activities in this chapter focus on gait, activities of daily living, vision, and motor coordination. You’ll also find games that target all areas. Adding cardiorespiratory elements to balance training is easy! This chapter offers lots of ideas for setting up sessions dedicated to cardiorespiratory endurance or adding cardiorespiratory endurance activities to your balance classes. A practical reference for professionals working with older adults, including personal trainers, physical therapists, therapeutic recreational specialists, activity leaders and directors, and administrators working in assisted living facilities, retirement housing, and nursing care centers. Also a supplemental textbook for courses that train students to work with older adults. Sue Scott, MS, is an exercise consultant, balance specialist, and active living consultant. In her work with older adults and through her fitness company, Renewable Fitness, Scott focuses on bettering the health and well-being of seniors, particularly frail older adults. Scott has over 10 years of experience working exclusively with seniors and fitness. She has worked in fitness as an educator, researcher, consultant, and personal trainer since 1986. She is certified as an American College of Sports Medicine (ACSM) health and fitness instructor and an International Dance Exercise Association(IDEA) master trainer. Scott is the creator of the Adventures in Better Living through Exercise (ABLE) Bodies Balance Improvement Protocols. A National Blueprint on Active Aging grant in 2003 enabled Scott to research the effectiveness of the ABLE Bodies balance techniques in a randomized, controlled trial. In 2005, Scott presented her findings at the American College of Sports Medicine (ACSM) conference in Nashville as well as the International Association of Homes and Services for the Ageing (IAHSA) conference in Norway and the American Public Health Association (APHA) conference in Philadelphia. In addition to teaching group fitness classes and personal training for seniors, Scott is collaborating with Fay Horak, PhD, John Nutt, MD, and others at Oregon Health and Science University (OHSU) to develop an at-home exercise program to delay mobility losses in Parkinson's patients. She is also working with OHSU biomedical engineers Misha Pavel and Holly Jimmison, PhD, to develop interactive exercise videos for frail seniors and for those with Alzheimer's. In her free time, Scott enjoys skiing, mountain biking, gardening, and vacationing with her family. She and her husband, Rick, and their two children reside in Happy Valley, Oregon. As a bonus, access to a dedicated ABLE Bodies Balance Training Web site is included with the book. It offers 15 downloadable activity handouts that instructors can print out and distribute to patients or clients for use at home. It also offers downloadable printouts of all the balance training activities in the book—over 130 conceptual ideas and activities for instructors to choose from either for planning their own sessions or for aiding their delivery of the 16-week session plan. Instructors can access the supplemental materials at www.HumanKinetics.com/ABLEBodiesBalanceTraining.